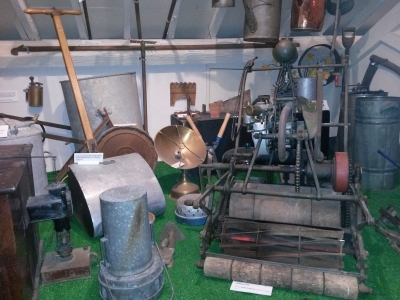 Helston Museum is a great place to view historic local artefacts. For mower enthusiasts their is a small "garden display" sporting an Atco, (with fine cutting cylinder) and a 14" Flexa Sidewheel, made in Woking. After Helston we traveled on to Portreath, where we stopped off at Portreath Garden Machinery. In an age of "disposable" mowers, it was good to "discover" this excellent well stocked showroom, with a comprehensive range of garden equipment and spares. Not only that, it has a small collection of Lawn Mowers and larger agricultural bygones. Quote "In an age of "disposable" mowers, it was good to "discover" this excellent well stocked showroom, with a comprehensive range of garden equipment and spares." Well, there's a familiar name from my past - we supplied them with TuffTorq transmissions and parts until I sold up and retired in 2011.